ABC Family has renewed their new Stitchers TV show for a second season. Six episode have aired so far and averaged a 0.38 rating in the 18-49 demographic with 930,000 viewers. The summer finale is scheduled for August 4th. 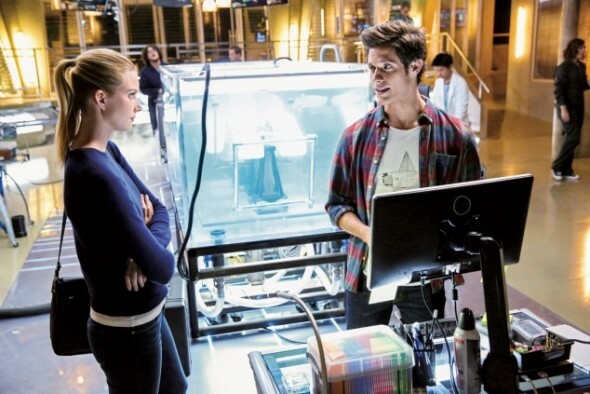 On Stitchers, a highly intelligent computer science grad student (Emma Ishta) is recruited into a covert government agency to be “stitched” into the minds of the recently deceased. Using their memories, she’s able to help investigate murders and decipher mysteries that otherwise would have gone to the grave. The rest of the cast includes Salli Richardson-Whitfield, Kyle Harris, Ritesh Rajan, and Allison Scagliotti. Burbank, CA (July 14, 2015) – ABC Family today announced that the hit original drama series “Stitchers” will return for a second season. The first procedural program for the network, “Stitchers” is currently airing Tuesdays at 9:00PM – 10:00PM ET/PT. The summer finale will air August 4, 2015. Launch to date, “Stitchers” is cable TV’s #1 scripted series on Tuesdays at 9 o’clock in Adults 18-34, Women 18-34, Viewers 12-34 and Females 12-34. “Stitchers” is executive-produced by Jeffrey Alan Schechter (“Overruled!”), Jonathan Baruch and Rob Wolken. The series stars Emma Ishta as Kirsten Clark, Kyle Harris (“Carrie Diaries”) as Cameron Goodkin, Ritesh Rajan (upcoming “Jungle Book” feature) as Linus Ahluwalia, Salli Richardson-Whitfield (“Eureka,” “I Am Legend”) as Maggie Baptiste, and Allison Scagliotti (“Warehouse 13”) as Camille Engelson. What do you think? Do you like the Stitchers TV show? Are you glad that it’s been renewed for a second season or, do you think it should have been cancelled instead? I was told about this show by a friend and am catching up via binge-watching on Hulu- I need a season three, please!! This is another geeky show with sly humor, unusual psychology, plus a little soap opera drama. It’s another cult drama with science theories and geeky hard-to-get humor, which will absorb a lot of fans while others are like “What!? !” I think geeks will despise a swift end to such an intriguing show. I just hope that the average populace (except for a few with geeky significant others or roommates) won’t vote this series off, because it honestly has a wonderful concept for the plot line and some brilliant actors. the story line does not follow very well. The writers cannot keep a good flowing story line. Maybe you didn’t start from the first episode. It flows very well, if you are paying attention. May I suggest Hulu? I am relatively certain you can get a free week to catch up! I agree. Plus, their season cliffhangers were basically the same, just with a character switched…. this show need to be put out of it’s misery. It’s a dead show walking. Won’t get past the third season with the ratings it’s getting and the fans can’t carry it forever. I love the Stitchers show and am very glad its renewed for a second season. It is very appealing for something different to watch other than all the same usual themes on tv.